My name is Ally and I am a currently a college junior studying Information Systems and minoring in Sociology. Outside of reading, I enjoy participating in extracurricular activities and watching Netflix shows. Some of my extracurricular involvement is in the Society of Asian Scientists and Engineers & Kappa Phi Lambda Sorority Inc. My favorite Netflix shows currently are Sense8 and Riverdale! As for books, I mostly read YA fantasy novels, but I branch out once in awhile when I want to try something new! I started reading in elementary school with Twilight and the Pendragon series being my most notable favorites of the time. 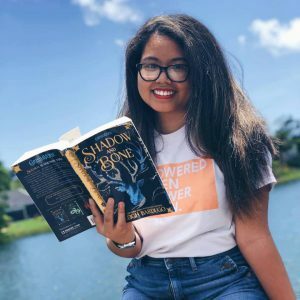 I created this blog, because I don’t have many favorites in real life that enjoy reading as much as I do and the same genre that I read as well. This is a place for my thoughts about books and to spark conversations with other like-minded individuals! I post at least twice a week unless my schedule is unnaturally hectic. Hiya! My name is Ally! I'm a 20 year old college student and avid reader. Welcome to my blog!